With the Winter Olympics 2018 now well underway, the Biathlon events are also in full swing. Blending incredible strength and endurance with a sharp-shooting eye, Biathlon is one of the most highly-anticipated and closely-fought events at the Games. 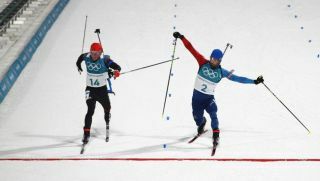 With the individual titles already wrapped up, with Norway's Johannes Thingnes Boe and Sweden's Hanna Oeberg taking gold in the men's and women's 20km and 15km mass start respectively, attention now turns to the team relays, where competition is set to be incredibly fierce between the likes of France, Germany and Norway. So whether you want to stream the Winter Olympics Biathlon 2018 online, watch it live on your television via cable or watch it, mostly without having to put up with any commercial breaks - we've got you covered. Here is TechRadar's quick and easy guide for how to watch all the Biathlon action at the Winter Olympics 2018 online from anywhere in the world - just remember to bear in mind that there's a nine hours time difference between PyeongChang and London and 17 hours with Los Angeles. If you are in the UK and have a TV Licence, you can watch the Biathlon action on BBC One or online NOW. See details below for the UK, the US and other territories. 2. Connect to the appropriate server location Simply open the VPN app, hit 'choose location' and select the appropriate location - it doesn't matter which one and it's super easy to do. 3a. Go to TVPlayer.com TVPlayer is a free, legal, online streaming service based in the UK which offers hundreds of channels - and you don't even need to sign in to get some Olympics coverage without commercial break. You will need to do a fair bit of channel hopping though and a lot of the events won't be available on free channels. Continue scrolling if you want to experience a fuller and richer version of the Winter Olympics. 3b. Go to TV.youtube.com Many online US-based TV streaming services offer NBC Sports as part of their bundles and a few of them offer trials and the best one is YoutubeTV, an official Google product. You can trial it for 30 days; the ability to record to the cloud and hold up to six accounts per household (and 3 simultaneous streams per membership) are its most alluring selling points. You can watch it on most devices and there are no fees for cancelling. If you are in the US, that’s a straightforward process, as NBC will broadcast the whole of the XXIII Winter Olympics, including all the Biathlon action, on its website and through its NBC Sports app for free (Android, iOS, Windows, Roku, Chromecast, Xbox, Samsung, Amazon Fire TV). It is not known whether NBC will allow anyone to view the 2018 Winter Olympics without registration or existing subscription as it was the case previously. NBC Sports is available on Youtube TV.